A new play written by Eintou Pearl Springer on the Orisa Ogun will be part of the programme for this year’s Ogun Festival, a three day festival celebration of the Yoruba deity Ogun at the Ile Isokan compound Niles Trace Febeau Village, Lower Santa Cruz from October 5-7, 2018. The Festival, which has been running since 2006, explores ancient and contemporary meanings of the Orisa Ogun. Originally revered as the warrior, hunter and blacksmith in Nigeria, that understanding has expanded to include responsibility for roads, forms of transport and technology, while in Trinidad Ogun is also regarded as the patron Orisa of the steelpan. ‘The play tells the story of how Ogun was the only Orisa given the power to transform minerals in the earth into metal and connects also to the evolution of the steelpan from the discarded oil drum. Ogun’s warrior energy is embedded in this instrument of spirit and resistance,’ explained playwright Eintou Pearl Springer. The Festival begins at 6 p.m. on Friday October 5 with a discussion on ‘Manifestation’ in Trinidad Orisa practice and features local Ifa/Orisa priests and practitioners. On Saturday, the play will be preceded by storytelling from 3.30 p.m. led by Eintou Springer and graduates of the Mentoring by the Masters programme, who will also perform the play at 6 p.m. This will be followed by a discourse on Manifestation in Nigeria led by Araba Olatunji Somorin of Ketus Ifa Academy which is spearheading a more studied approach to the discussion of African spiritual practice with an Ifa/Orisa focus. Known as ‘catching power’ or ‘manifestation’, possession trance is described as a temporary alteration of one’s normal identity by an ancestral spirit or deity. The experience of being “possessed” holds different meanings in different cultures – from Christianity to Sufism to Hinduism – but is most commonly locally associated with African spiritual practice. The discourse will reveal some of the deeper social meanings of energy manifestation and how this affects our emotions, work interests and creative impulses. ‘The Festival comes to a close on Sunday with a street procession which serves as a celebration of Ogun as owner of the road and also appeals for protection of the community.’ said Oloye Ogunrinola Ogunbowale, head of Ile Isokan. Sunday’s closing celebration will also include steelpan and drumming. After the 2010 earthquake a small house was made out of rubble, wood and glass bottles. There is an altar and the sun filtered through the walls of blue, green bottles bathes the inside of the house in silence and light. The healing house is an important part of the post-earthquake recovery. It is a reminder that natural disasters require not just reconstruction of buildings but reconstruction of emotional, spiritual, mental stability. I’ve been thinking a lot about Haiti in these days following our own earthquake encounter. Like everyone else here I’ve made jokes while freaking out silently. Haiti we know has more than 200 years of staring war, tragedy, devastation and disaster in the face and managing somehow to emerge and find ways to keep going. I’m not so sure about T&T. We continue to fool ourselves that God is a Trini and that absolves us from adopting a more proactive stance on many things. It also means we take a lax approach to the mental health implications of natural and human disasters. In addition to being mindful of our building codes, we also need to be aware that humans will need to be checked for cracks and damage too. My first awareness of Lord Shiva came from the late Iyalorisha Melvina Rodney. She kept a large framed image of Him in the inner sanctum of her shrine, between Ogun’s cutlass and Yemoja’s wooden boat brought with a Yoruba woman to Trinidad after Emancipation. Behind the disguises of white saints, she had called on the spirits of her ancestors for strength, for healing and wisdom. On the days I spent in prayer and meditation in Iya’s shrine, I looked into Shiva’s half-closed eyes, and was drawn to that look, that dream state, the dreadlocks, the crescent shaped moon, the drum. Iya never explained to me why Lord Shiva was there, and I was too young to ask. One of the few times I talked at school about African spirituality, there was awkward silence and a similar tone of fear and contempt reserved for when the good and saved were discussing Hindus. I understood then why so many of my Hindu friends would stay silent when religion was being discussed. Pagan was a word that got thrown around a lot. It was just another word for weirdo. The other, the outsider, the misfit. The one who didn’t belong. As I got older I realised that I was less interested in belonging and more interested in finding a way to define myself on my own terms. Much of what I saw as a child started to come back to me in visions, in fragments of memory. The imperialist imposition of a young white man on a cross continues to dismiss and diminish everyone else’s spiritual consciousness to arbitrary definitions like pagan, heathen, un-saved. But if to be pagan means to feel connected to nature then I’m okay with that. If to be pagan means to feel a sense of community, a part of a living ecosystem that cycles from unborn to child to elder to ancestor and back to unborn then I’m also okay with that. If to be pagan means looking at the landscape and seeing yourself as part of it, part of shaping it and making it better, then I’m okay with that too. If to be pagan means to see god in your image and likeness then I’m okay with that. If to be pagan is to understand that your mother is your first notion of what god is, then I am okay with that too. In 2015, after spending the day playing Black Indian, I went to my first Shivratri and finally understood what Iya saw in those eyes. I can see now how our ancestors shaped their spiritual reality from dreams, from visions, from fragments of memory. They danced and sang and prayed themselves into this new existence. It was the only way they knew how to be. And in the same way that quantum physicists claim they can still hear the echo of that first big bang, it is the same way that Lord Shiva’s drumming of creation and destruction still echoes in our consciousness today. To be pagan means that you live your spiritual reality daily. It means that every molecule of your being vibrates with a frequency that existed before somebody dreamt up Adam. To be a pagan is to remember your personal divinity. Remember what it was like before people told us how to believe. And perhaps more important than what they remembered was what they created with that knowledge. What only exists in this space and time, in this reality. To be an example to the world of what civilisation could be. We can only be stronger by understanding each other. The shame and fear that was and still is associated with both African and Indian spiritual beliefs is part of the shared reality of life in a place like this, that can be so freeing in one moment and so imprisoning in the next. Our ancestors, our Orisas, our Devas would have it no other way. In these recession times we are suddenly being told go back to our gardens, to go back to our bush medicines, to heal ourselves with yoga, use drumming to heal mental illness. All the so-called pagan practices have now been repackaged by the west. The neo-pagans are making money from the shame our grandmothers felt for teaching us to make coconut oil. But there are no accidents in this life. Nothing happens by coincidence or chance and it is not by accident or chance that this place called Trinidad exists. That we are here having this conversation. That we are learning and remembering our obeah. That we are owning it. Understanding it. Claiming it and ultimately defending it against those who would use our own fears against us. Presented in April 2016 at Varsha Pratipada Sansad, Chinmaya Ashram, Couva, Trinidad. Orisa devotees from around Trinidad and Tobago will gather on September 24, Republic Day to observe the first annual Isese Festival – a celebration of this country’s African spiritual traditions. The gathering takes place at Centre of Excellence in Macoya and starts at 10.30 a.m.
Isese is a Yoruba word meaning Tradition. In recent years there has been a global push to reconnect with non-Western ideas of spirituality, and Trinidad and Tobago has been a leading part of that conversation through scholarly works and cultural exchange between Nigeria, Ghana, Cuba, the United States of America, Brazil and parts of Europe – all of which have seen increased interest and participation in African Spiritual traditions, specifically Ifa/Orisa. Currently the local Orisa community is in a state of evolution. 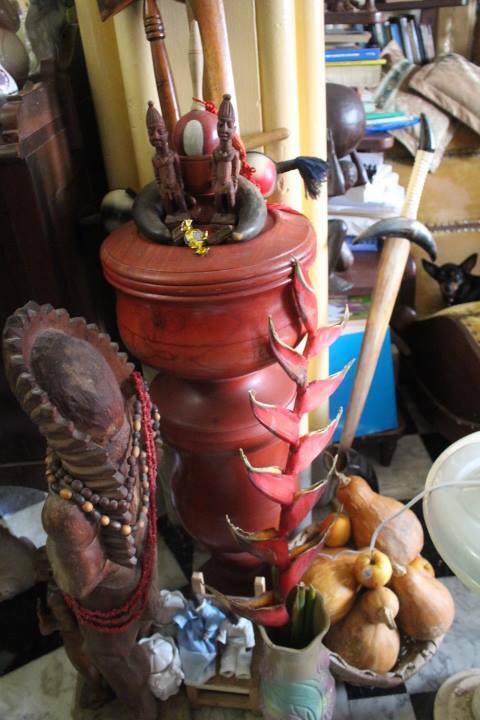 As the popularity of Ifa spreads, there are concerns about how this will affect our own traditions that have existed for over a century and have informed many social and cultural forms in Trinidad and Tobago. This is a unique opportunity to interact with practitioners from around country, with a view to strengthening cultural and spiritual ties. The morning session will include workshops in dance and drumming and a special panel to address questions that people have about Ifa/Orisa beliefs. The afternoon session includes performances from Wasafoli, The Trinidad and Tobago Orisa Performing Arts Company and pannist Noel La Pierre. The feature address will be delivered by Ifayemi Elebuibon, Araba of Osogbo, Osun State, Nigeria. Special tribute will also be paid to Elders of the Orisa community both living and passed on. The event is hosted by the Council of Orisha Elders in collaboration with the Afrikan Heritage Village Committee and Afrika House. A couple of weeks ago I saw a tasteless attack on Hinduism expressing some vaguely articulated fundamentalist Christian desire to return Trinidad and Tobago to ‘God fearing ways’. Forgetting of course that it was the church that Patrick Manning was building with his ‘Prophetess’ that was part of what hastened his being voted out. This week they, whoever ‘they’ are took a turn behind African spirituality, aping the same divisive colonialist madness that was used to keep Indians and Africans afraid of each other since the first ship landed here in 1845. The only reason anybody would put the Gods out of their thoughts, waste time and resources to make an ‘Obeah’ ad is because they/we remain mired by this Christian colonisation of our spiritual choices. We remain complicit in the contempt the society has for African spirituality and any other belief system that doesn’t subscribe to a Judaeo-Christian idea of who or what God is. ‘Obeah’ was used as a general term that lumped together all African spiritual practice and anything else that could be vaguely construed as a threat against colonial authorities. The fact that many of the spiritual practices of Orisa and Hindu and Indigenous devotees have clear and evident similarities will never be highlighted in any political advertisement. Go back and ask Iyalorisa Melvina Rodney why she had a big picture of Lord Shiva in her inner sanctum. Go back and ask Babalorisa Sam Phils how he knew so much Sanskrit. Go Enterprise and ask my Uncle Raviji why he invites Babalawos to his Mandir. Hinduism and Orisa and Indigenous beliefs have and will continue to coexist here. Regardless of the racist and misinformed backwardness that gets peddled as political rhetoric. Most PNM people also don’t know that the balisier has a wider meaning in the world of Orisa practice of the Caribbean. Last year when I went to Cuba I found out that they call the balisier ‘Sword of Shango’. I saw the balisier flower all over the shrines of Santeria practitioners. Shango was and continues to be a popular Orisa in Trinidad for a very specific reason. Many of the Yoruba people who were brought here after Emancipation were from Oyo, where Shango was a 13th century King of that large and ancient Empire. It was because of that longstanding connection to Oyo that they used to call all Orisa devotees ‘Shango people’. Go up to the hundred year old Orisa shrine on Upper St. Francois Valley Road and you will hear songs about Ibadan to this day. Y’all think Eric Williams didn’t know these things? Read more about Shango from eminent Trinidad born scholar Maureen Warner-Lewis’ Trinidad Yoruba : From Mother Tongue to Memory. CLR James said in Black Jacobins ‘voodoo was the medium of conspiracy’. It was the Vodun ceremony held at Bwa Kayiman on August 14, 1791 that was the catalyst of the Haitian Revolution. If it wasn’t for obeah, Vodun, secret societies, ancestral rituals, masking traditions, Ogun manifesting in the steel pan we would not have survived the Middle Passage or enslavement or colonialism or the continued attempts to deny us the fullness of who we are. All of the born again Africans and Afro-Saxons waving their Swords of Shango, I ask you what the PNM is doing to protect you at the core of your spiritual beliefs? We write to inform you that an Assembly of Citizens drawn from a number of civil society organisations has joined the call for a halt to the parliamentary debate on the Constitution Amendment Bill, 2014. We draw your attention to the fact that the proposal of a run-off vote as contained in the Bill before you, was not the subject of any public discussion before being tabled in the Parliament. We therefore urge you to exercise your judgment and authority to ensure that this omission is properly repaired before the Bill is taken to the vote. We feel certain that you have a clear understanding of the difference between what is legal and what is right in the context of a representative Democracy. As custodians of the public interest, we urge you to utilize your Constitutional power and responsibility to ensure that this amendment to the Constitution, which is being brought to you unprotected by the requirement for a special majority vote, does not move past the Senate without the benefit of broad public consultation in line with the mandate given to the Constitution Reform Commission. In as much as I am anti-establishment and mostly uninterested in displays of nationalism, it was telling that as we sang the anthem at the adjournment of the sitting of the Lower House at which the Constitution (Amendment) Bill 2014 was passed just after 4.00 this morning, the UNCites didn’t see it necessary to stop their exit from the building to stand at attention. They kept walking, as if we needed any more proof of utter lack of respect for the country and the people. Anyway, we’ll be back out in front of Parliament today at 3 p.m., recess or no recess and every day until the Senate sitting next Tuesday. Everyone needs to petition the independent senators. A document is being prepared that outlines why this Bill must not be made law to be distributed to people who want more information. – The police are on the side of the people. They came and said this to us on more than one occasion. – HOWEVER: the police have been given a mission to infiltrate and destabilise any sign of resistance. If you come down to the Waterfront please be aware that they are making an effort to antagonise people by quoting repealed laws and saying things like ‘we could lock allyuh up yuh know but we giving allyuh a bligh’ so that at the first sign of vexation they can start to beat people and lock them up. Read Article Four of the Constitution. Don’t give them the opportunity. – A member of the renta crowd positioned at the barricade to skin teet with Aunty Kamla slipped a media worker a note on a copy book page saying she couldn’t talk because she was a CEPEP worker. – People came from all over Trinidad last night, including a woman who travelled home to Chaguanas to bade and feed her dogs but came back and spent the rest of the night. – There was a steady crowd throughout the night, we pooled resources to make sure that everyone was fed and and watered. – Hyatt have nice toilet. – There are 10 CCTV cameras that are in plain view outside the Parliament. – Aunty Kamla feel she smart but she needs to realise that Trinis will take and take and take and then make you eat the bread the devil knead. The devil start to weigh flour last night.